Weatronic Clever 6 Receiver 2.4 Dual FHSS. The Wing Bag sewn from polyethylene foam laminate protection fabric. It is glued the logo Blaster and sewn on stickies to secure bags on the wings. In the modified Wings Bags for Blaster has a pocket from Teflon for the stabilizer, which is used by Blaster 2 and Blaster 3. Due to the special valve, your stabilizer is protected from loss and deformation during transportation model. The Blaster 3.5 wing is being constantly modified. 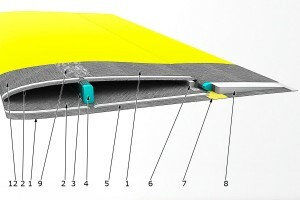 Here one can see the current (up to date) configuration of the wing. Blaster 3.5 SC wing suits perfectly both for calm and windy weather. 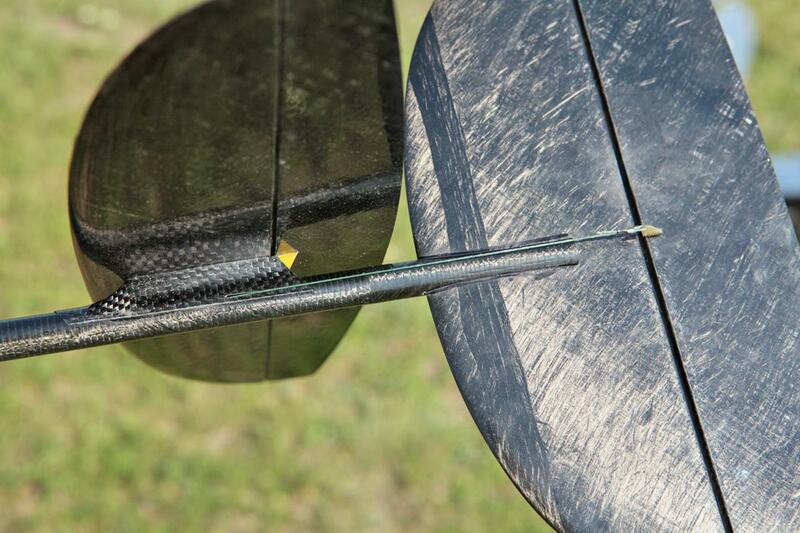 This wing has a total weight of 127-133 grams (depending on color). We use Carboline SC_26_2/45 fabric for outside layers and Carboline SC_26_2/30 - for inner layers. 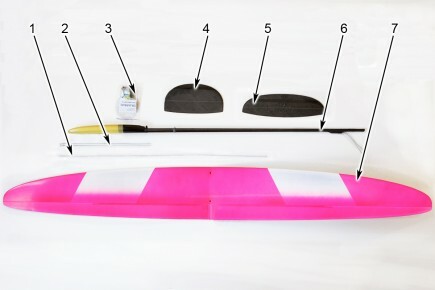 This allows to obtain very strong and lightweight wing. 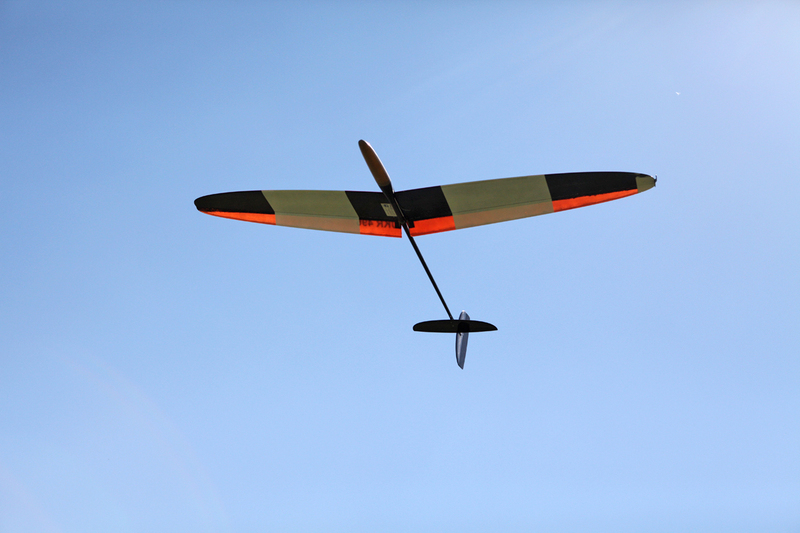 Due to rigid wing skin the model can be launched 10% higher and is very sensitive to ascending currents. 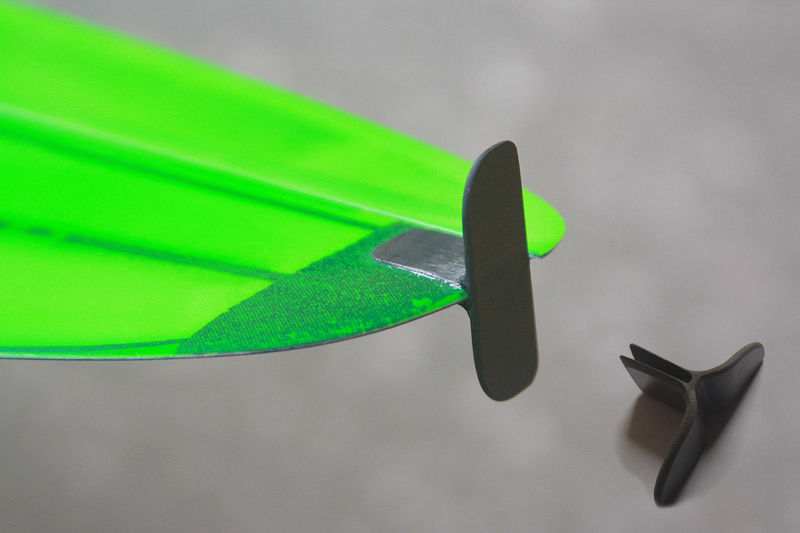 Due to the fact that regular wing Blaster 3 lighter than the previous version of the glass Blaster 3 light wing. 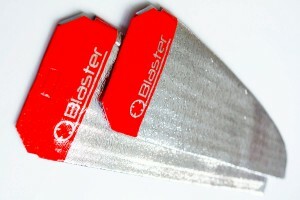 Blaster 3.5 strong perfectly suits for windy weather. 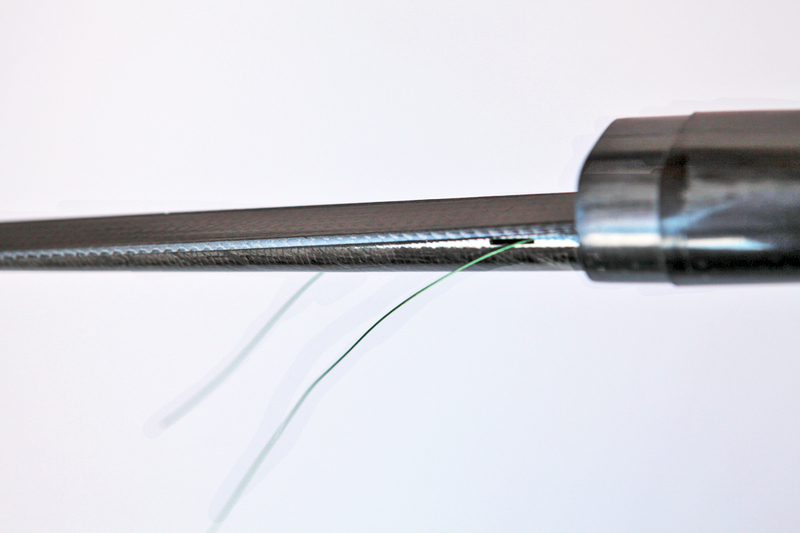 third longitudinal layer of Carboline, which adds even more strength. 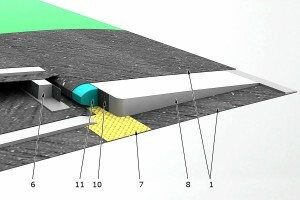 The rigid skin helps to save plane after collisions of the planes in the sky or after rough landings. 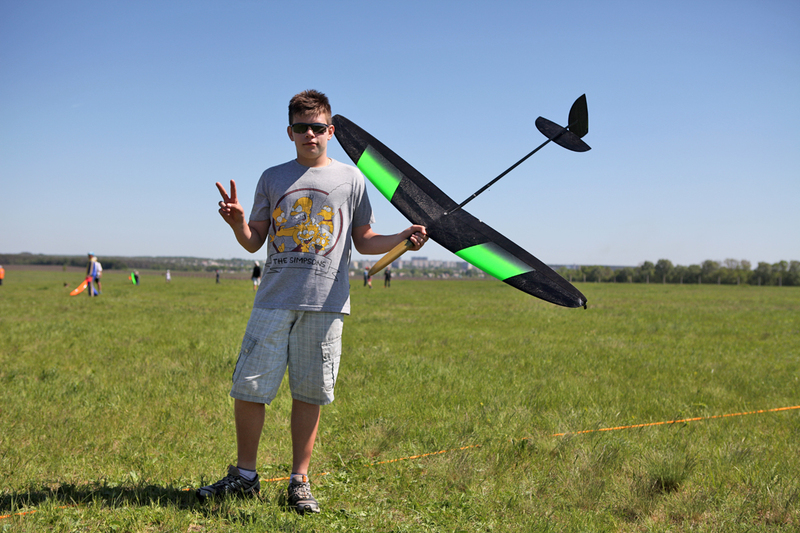 Igor Butseroga noted that due to extra wing rigidity he has increased stability and height of launch. 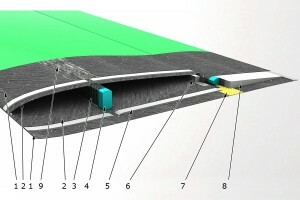 The rigid skin helps to save plane after collisions of the planes in the sky or after rough landings. 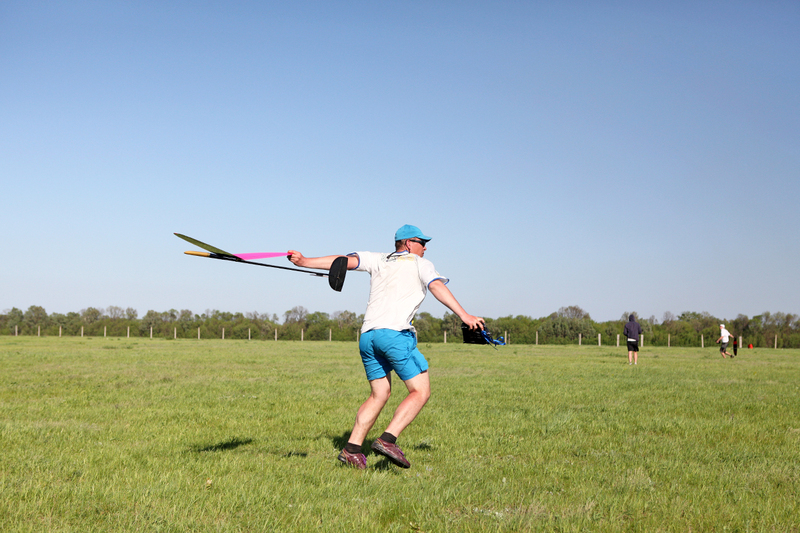 Blaster 3.5 wing perfectly suits for windy weather. An icing on the cake makes a convenient launching handle located at wingtip of Blaster 3.5. You can grind it a bit to make it more comfortable for your personal grip. 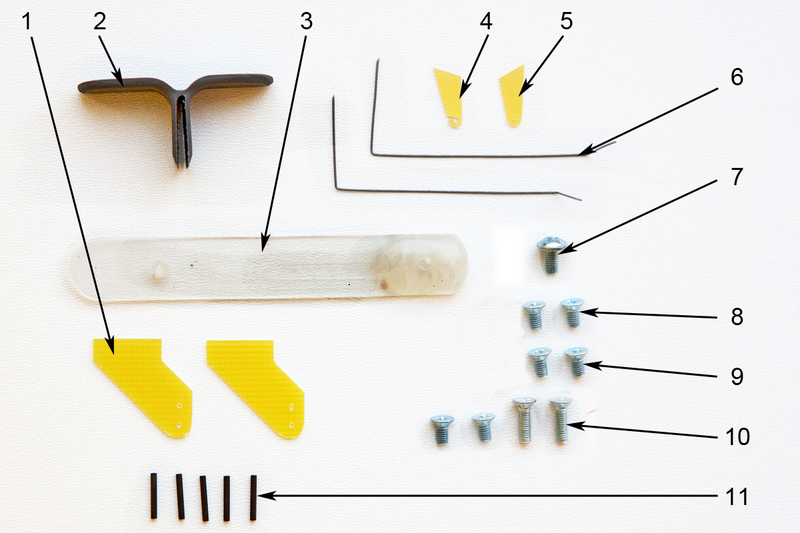 Then just mark the place where you want to locate it and glue the handle with liquid cyanoacrylate (Super Glue). New state-of-the-art airfoils and fin shape are optimized by Joe Wurtz for high launch height and perfect controllability. 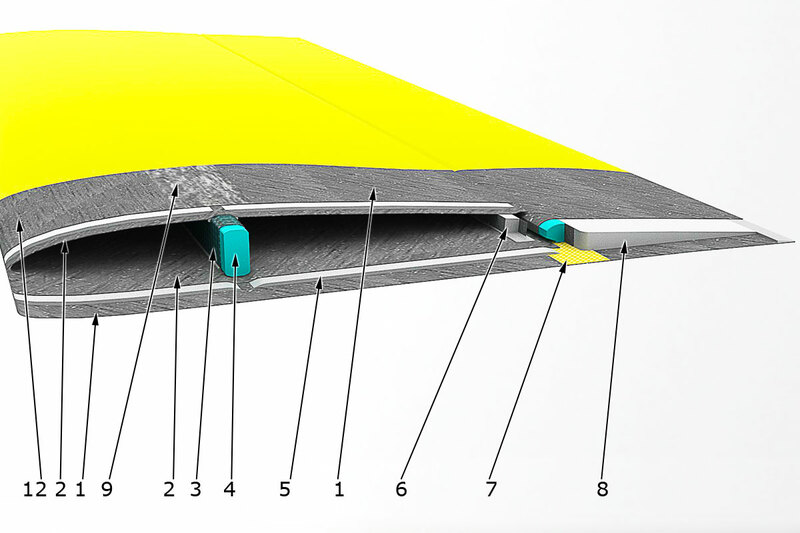 Apart from geometry and weight the new fins also benefit from increased strength due to utilization of Carboline and Rohacell core. 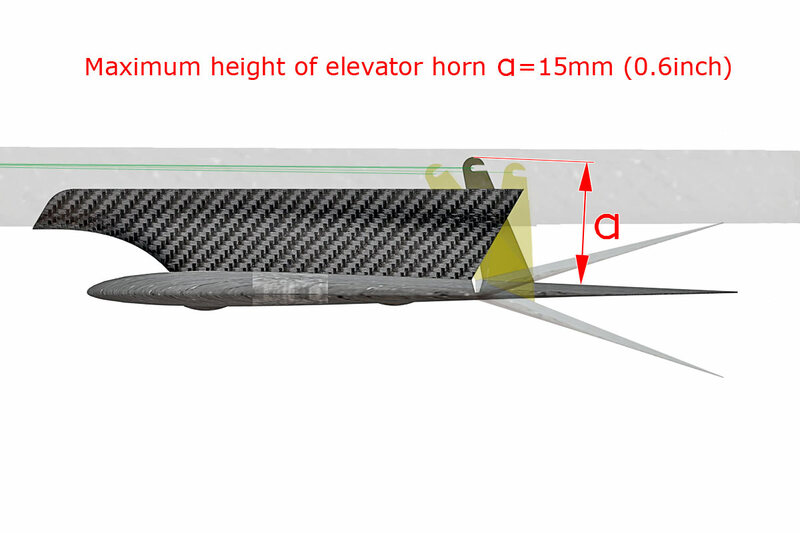 Upper and lower parts of the fin are symmetrical, which results in considerably lower torque loads on tail boom. 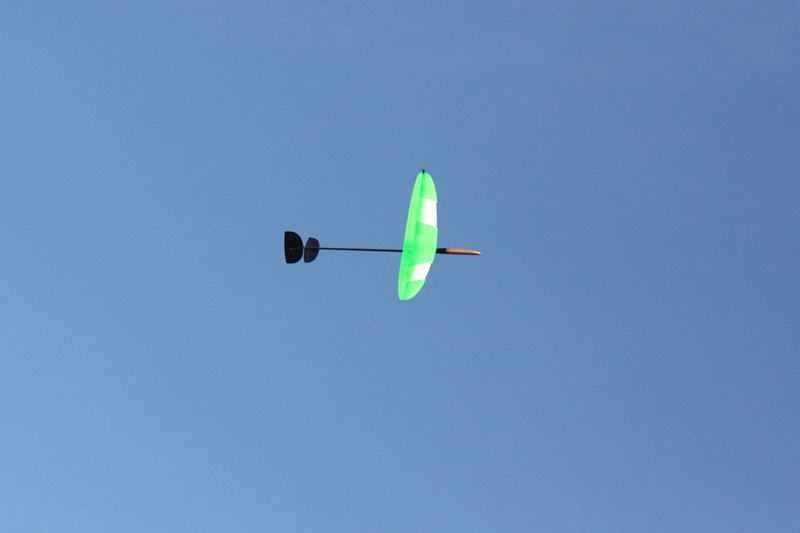 Due to asymmetrical fin profile by Joe Wurtz longitudinal oscillations fade away quickly after launch. 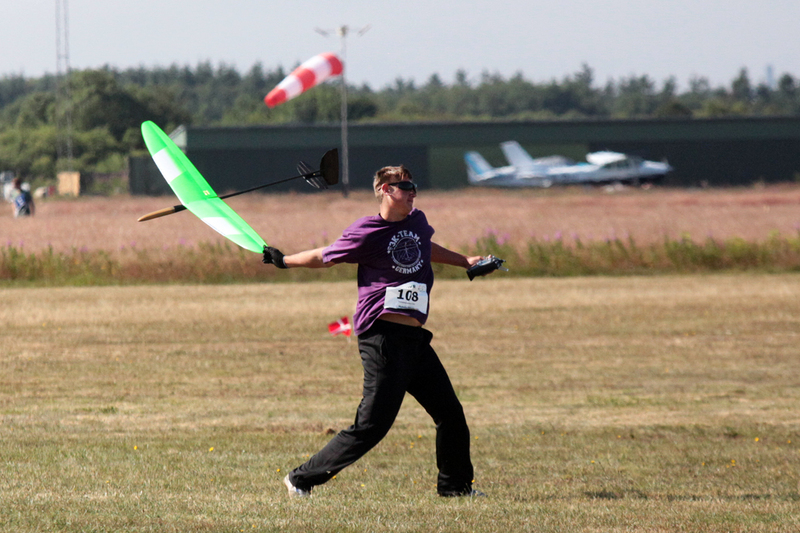 Snipe fin is the same for right-handed and left-handed pilots. Just pay attention during the assembly, the fin can be mounted into the slot in the fuselage with both sides, depending on the fuselage type. 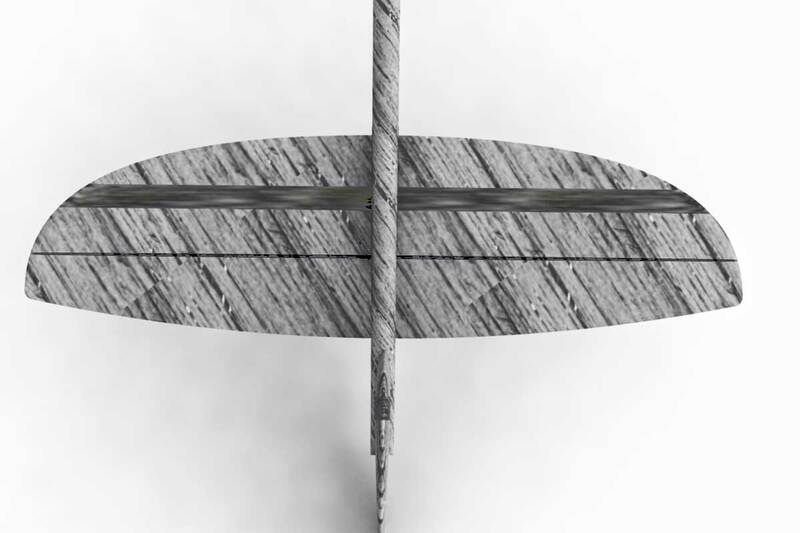 Yes, we produce two versions of fuselage. New stabilizer with elevator has significantly increased rigidity of whole control system. 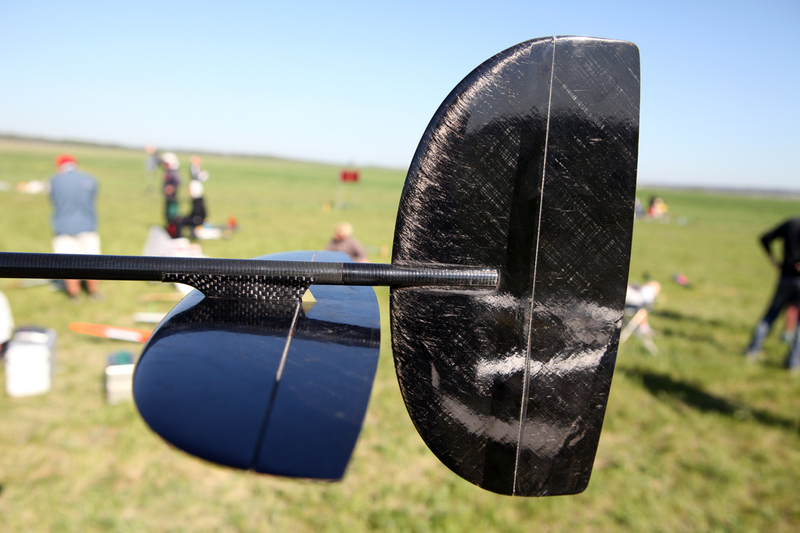 The stabilizer is mounted on the pylon beneath the tail boom. This allows to use torsion bar and cable rod, which results in weight reduction and absence of backlash in control system. The fin and stabilizers are shipped preassembled with rudder and elevators already installed. Horns for cables are included in the kit. 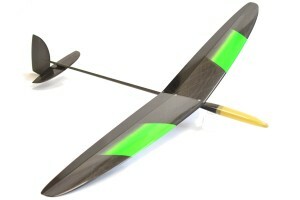 Blaster 3.5 fuselage is a one-piece carbon beam with radio transparent cap made of kevlar and built-in wing mounting rings. Blaster 3.5 beam is made of high-modulus carbon strengthened with two layers of Carboline ±45° that take torsional and impact loads. 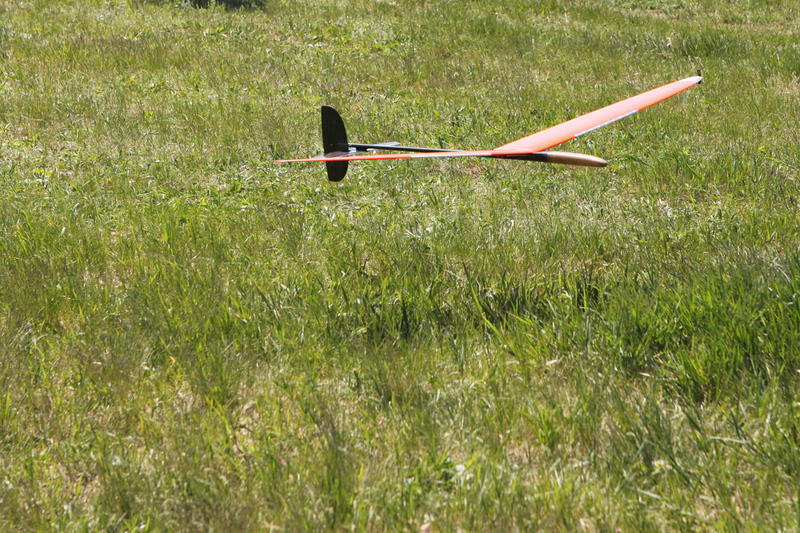 The beam is notable for its increased strength, required for high launches and durability for rough landings. The wing is attached to two rings that belt around the fuselage beam. 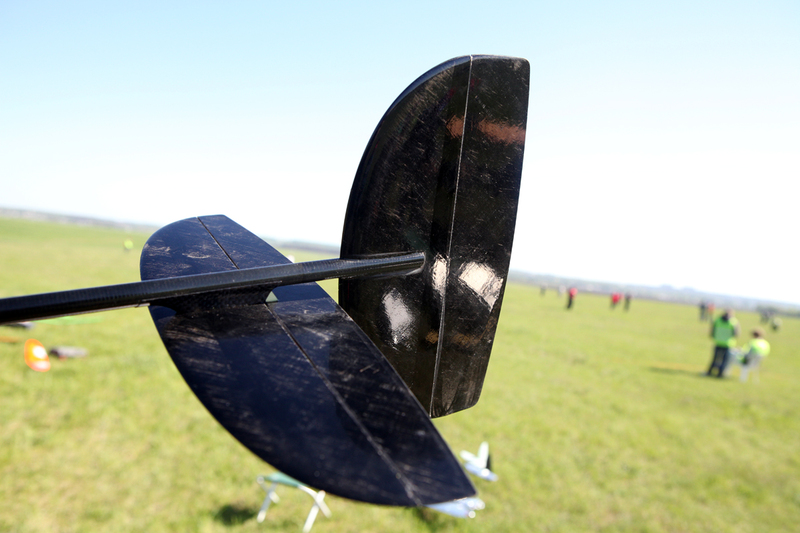 Conical mounting surfaces define wing position explicitly and are good at transferring the load to the fuselage. 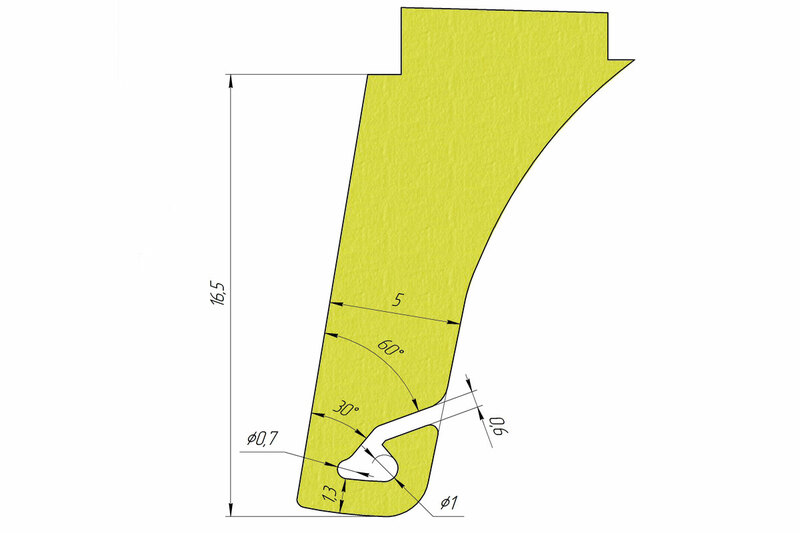 Wing fillet cross section is not circle-shaped in the place where the wing is joined with the cap. Now you can hold your plane by the cap not being afraid that a sudden puff will twist the plane. The pylon can comfortably accommodate receiver or battery depending on the centering you choose. 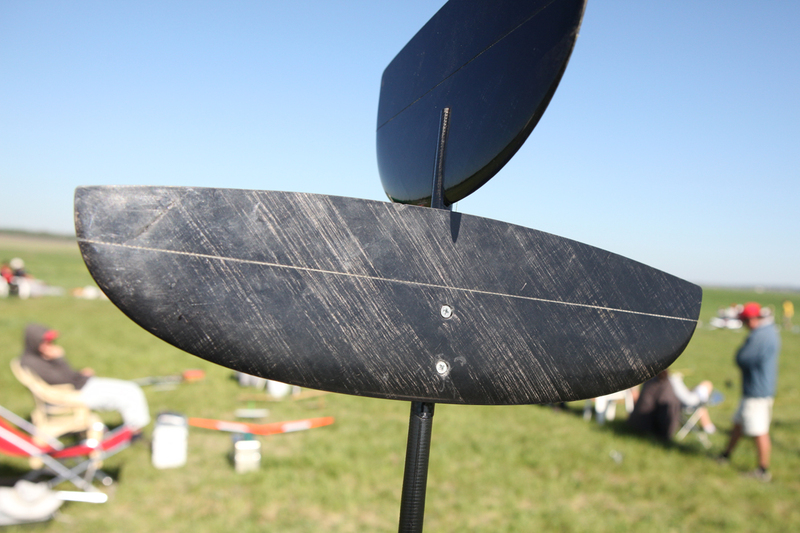 Stabilizer pylon made of carbon is glued under the tail boom. Elevator horn is elegantly hidden in the pylon slot. There is a groove inside the pylon for the elevator cable. Balster 3.5 fuselage is shipped pre-assembled with cables already drawn. You just have to attach the fins, install servos and wing pushrods. Please, pay attention, we produce two versions of Blaster 3.5 fuselage. 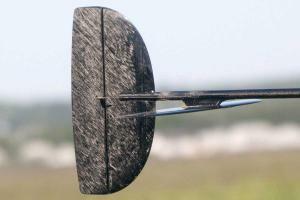 There are versions with fin slots for right-handed and left-handed pilots. Ballast installation, mounting and position adjustment are well thought-out. Inside the beam under the receiver there is a special part weighting just 0.02 oz that fixes the ballast inside the beam. 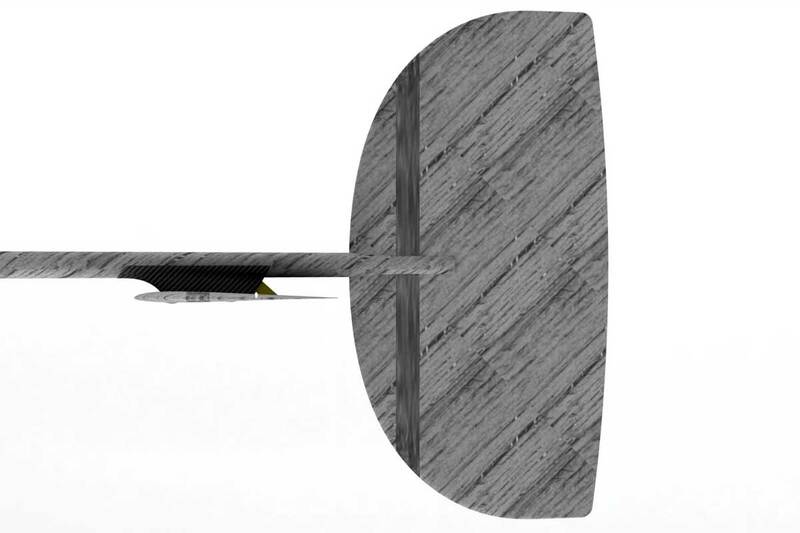 There is a rib inside the tail boom to hold the cables closer to the upper part of the fuselage. 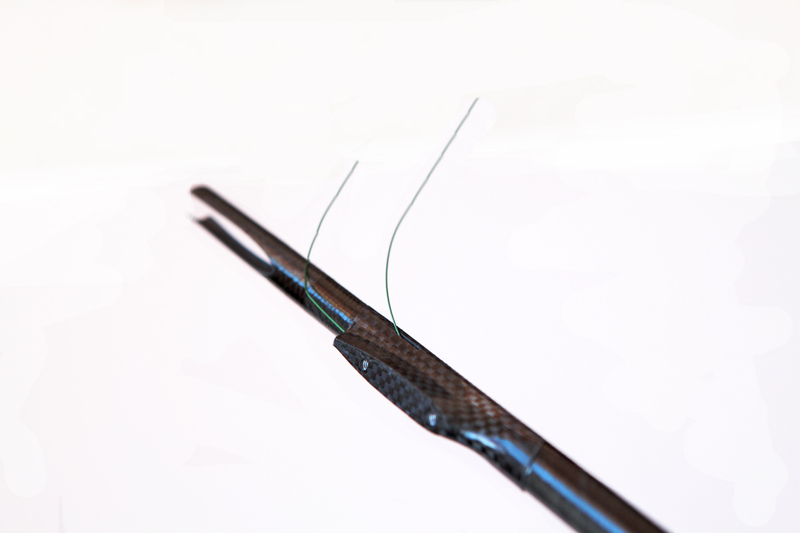 Cabling with torsion bar is one of key advantages of Blaster 3.5. 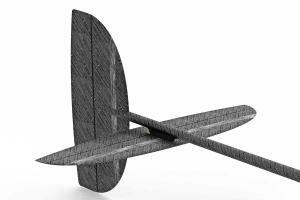 Due to this system the plane is more lightweight and backlashes are minimal. 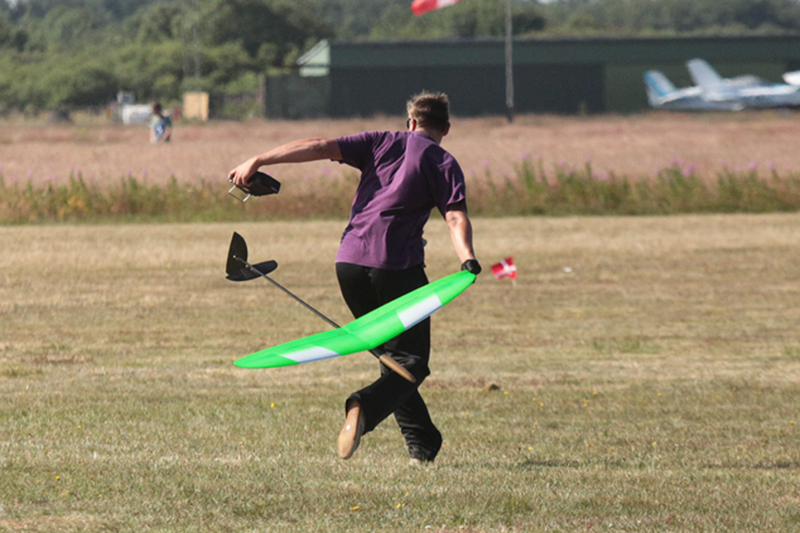 As a result the behaviour of the model in the sky is more confident, control of the fins is as effective as it could ever be, and all this provides you more positive flight experience. The model is shipped with all cables preinstalled. All you need is to hook up the rudder and elevators to the control cables. When the cap is removed you have an easy access to all on-board hardware. 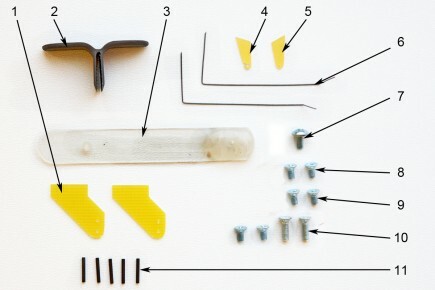 Due to this design it is very easy to install the hardware when assembling the model. 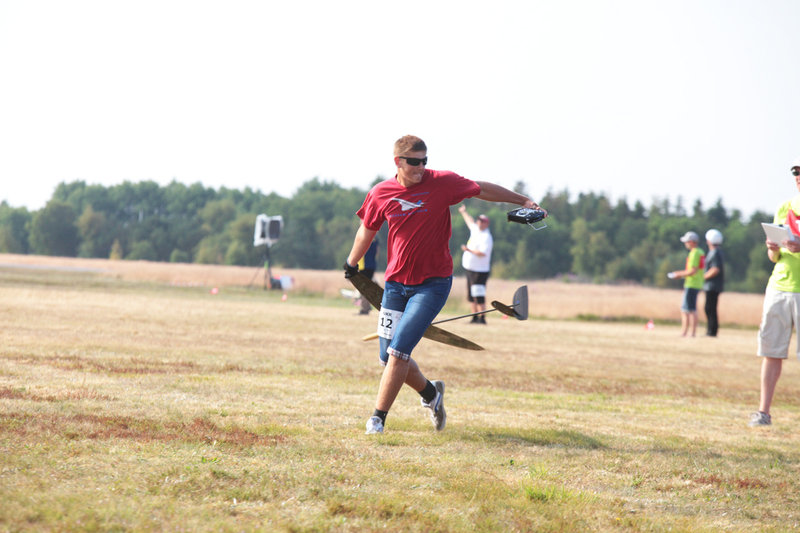 Location of all the servos inside the fuselage helps to perfectly balance the plane and allows to attain higher rigidity and minimal backlashes of the aileron control system even compared to the RDS technology. 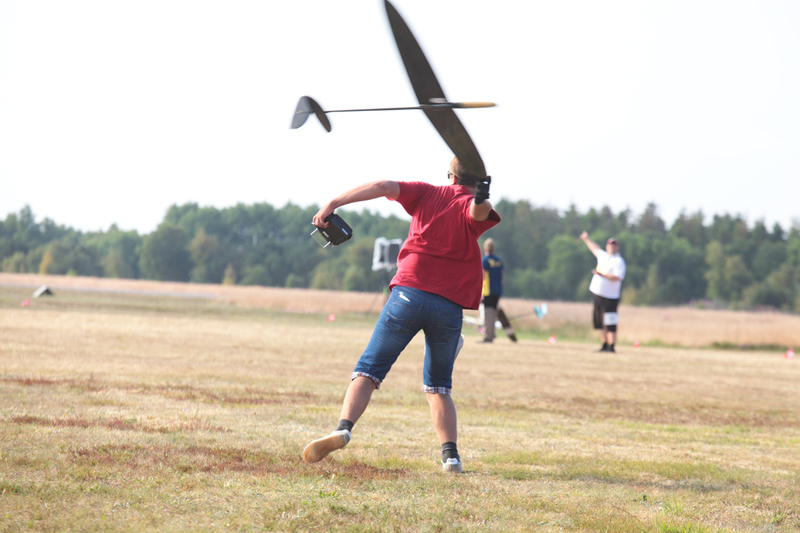 It is based on the wing from Balster 3, a wing that gained excellent reputation for the last several years. 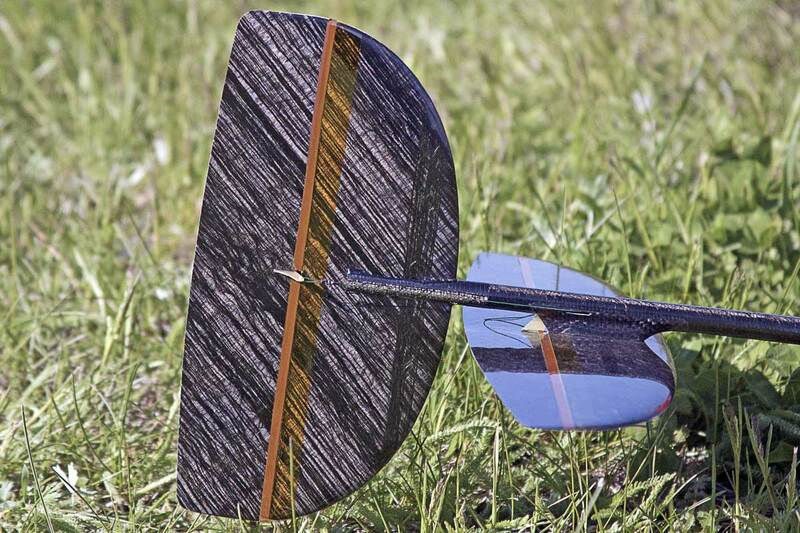 Outstanding aerodynamic characteristics calculated by Dr. Drela and persistent wing design optimization are the key components of this model's success. 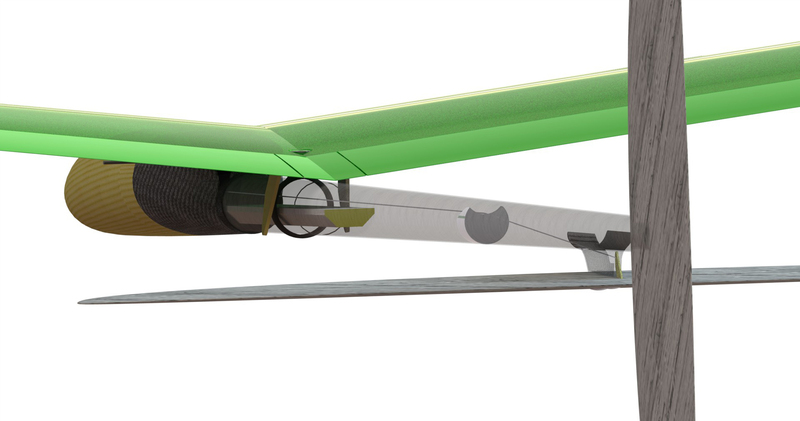 The fuselage of new model, while preserving same simple assembly procedure, easy maintenance and exceptional strength as its parent ­­– Blaster 3, benefits from new high-modulus carbon parts and pull-spring system. These new innovations help to considerably reduce weight and increase strength. 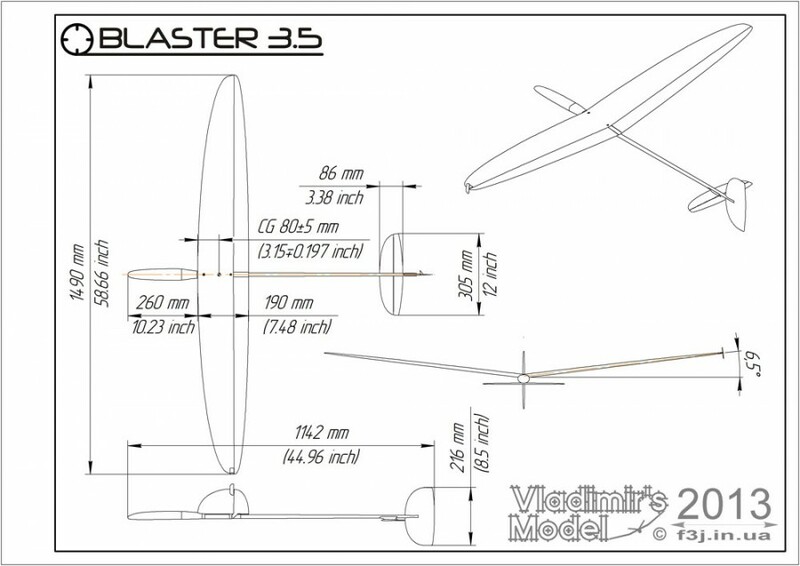 Balster 3.5 fuselage is shipped pre-assembled with cables already drawn. 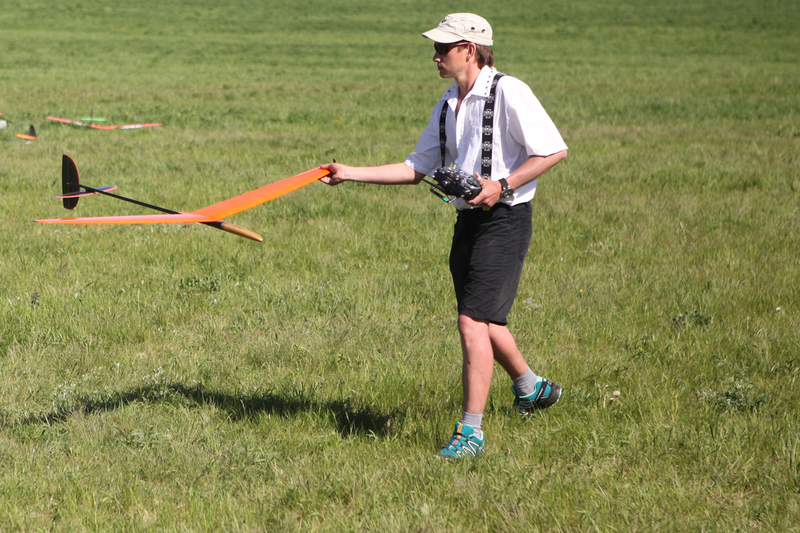 You'll need less than three hours to install the servos and set up the transmitter. Two years of experiments on optimization of control system and aerodynamics were systematized by Joe Wurts. 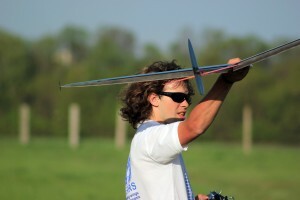 His work resulted in brand new airfoils and geometry of fins and stabilizers. 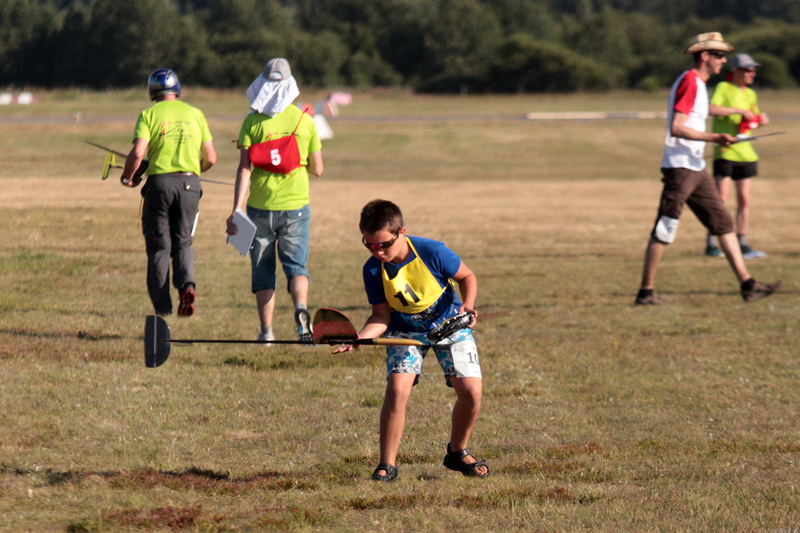 We've achieved balance between two contradictory tasks – we've enhanced the controllability together with increasing the launch height. The pilot will also benefit from the increased strength of the fins with minimal weight. 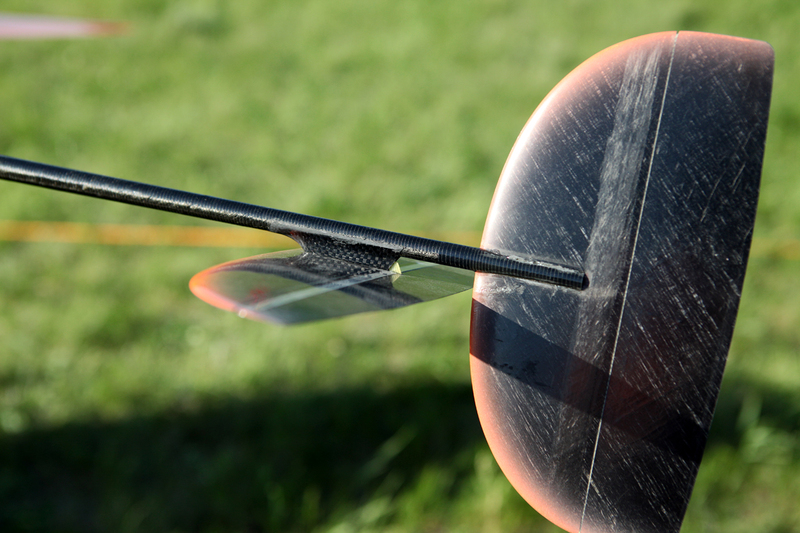 Due to the symmetric geometry of the fin the torque loads on the tail boom at launch phase are significantly reduced.